HRO - COMMUNICATION RECEIVERS - "The Cream of the Crop"
This article is rather lengthy and changes style towards the end. Towards the end of this restoration I had started using a "journal" approach to these restoration write-ups that have the work progress as a daily entry, like a log. Since the restoration of E-50 took seven years from start to finish, I guess some evolution in my writing style must have also happened. Pre-restoration - The photos to the right show E-50 as received. The condition is actually not too bad when considering the storage and history of E-50. 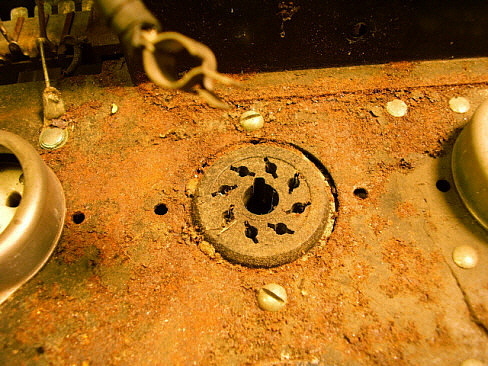 Obvious problems are the rust issues which will require extensive disassembly. The modifications to the Mixer and Detector tube sockets will require obtaining original type sockets. Six-volt tubes are installed. The pilot lamp shouldn't be installed on a second production run receiver. The PW-D is the incorrect vintage and is missing the number dial. 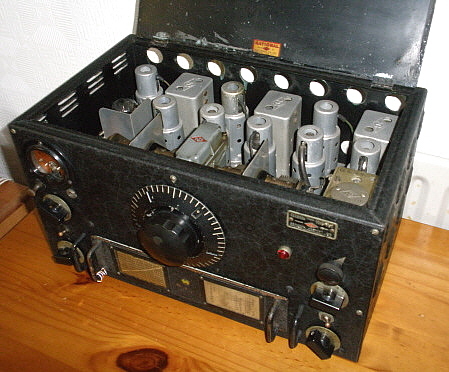 The S-meter is the later Marior Electric type (1938) and meter switch isn't original either. The dial pointer is not the correct vintage. The RF Gain knob is a later style. The coil set installed is a late-WWII or post-WWII vintage. Note that the lid finger projection has been flattened, probably to have the receiver installed in a rack. The photo left shows the underneath of the chassis of E-50 as received. 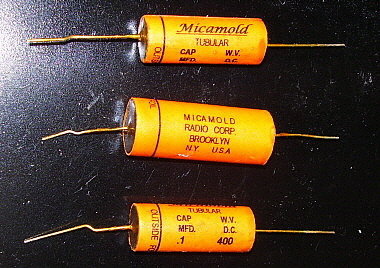 The five orange paper capacitors are the only original Micamold brand types that haven't been replaced with other types. There are a handful of original white ceramic leaded-end resistors still in the circuit. Most resistors appear to have been replaced just after WWII judging by the types used. Wires that aren't black are non-original. Note the Mixer socket and the Detector socket are octals and all of the associated parts are replacements. The shielded wire from the Antenna terminal is not original. Disassembly and Chassis Restoration - Note the photo to the right showing the severity of the rust. It was going to be necessary to completely disassembly the E-50 chassis right down to the rivets in order to fix the rust problems. With careful drilling the rolled ends of the rivets can be removed and then the rivet driven out with a small punch. This allowed complete removal of all parts on top of the chassis. Additionally, with the rivets removed the complete circuitry from under the chassis can be removed intact. This will make reassembly of the circuitry much easier than if all of the parts were removed individually. The chassis is painted with nitrocellulose lacquer and we are going to repaint using the original type of black nitro-lacquer paint. This means the complete removal of the old paint is not entirely necessary. The new paint will not react with the old paint and the places where the new paint covers old paint will not show since the edges are sanded and feathered. The easiest way to get at all of the rust is to just use sandpaper and wire brushes to remove it. The end result can be seen in the photo below. The chassis then needed the miniature tube socket hole filled. It can be seen in the "before" photos above and in the "sanded" photo below. Bondo was used to fill the hole. After sanding down the Bondo, it has to be primed with lacquer and then sanded lightly again. This seals the Bondo for final painting. Several coats of lacquer were applied to the chassis and the finished results are seen in the photo to the right. Don't worry if you get a "run" in the paint when doing the chassis. ALL originals I've seen have runs here and there, after all, it's just the chassis. Also, you don't want a "mirror" finish to the paint on the chassis. All of the originals I've seen are mildly satin finished with very little, if any, gloss. Fake rivets were made to replace the original rivets. Fake rivets are made from 6-32 screws that the head are reshaped to look like rivets. The parts are then mounted with lock washers and nuts. The end result is original appearance and better electrical contact to the chassis. The aluminum shields for the IF transformers, the BFO coil and the tube shields all required a chemical treatment to return the flat-satin finish that the aluminum pieces originally had. I had to disassemble the IF and BFO units so only the shield-cans would be involved in the chem-treatment. I use sodium hydroxide which is easily found in Easy Off Oven Cleaner (EOOC.) The active chemical is basically lye and it will react fairly quickly with aluminum. I spray on a heavy coat of EOOC on the aluminum piece and then wait about one minute. If there is a lot of corrosion, I'll work the EOOC around the aluminum piece with an acid brush. After about two minutes, I rinse the piece in cold water. You can't rub the aluminum after this treatment or it will slightly polish and ruin the flat finish we are trying to achieve. Let the pieces "air dry" and reassemble after that. The photo to the right shows E-50's chassis assembled with the EOOC treated aluminum pieces installed. HRO Cabinet and Panel Painting - The original black wrinkle finish used on all early radio equipment was a two-part process that used a base coat of Nitrocellulose Lacquer followed by a spray-on catalyst that was heat-activated, usually requiring oven-baking to produce the finish. Today, all we have available is a single-part process that can work quite well if the proper conditions are provided for the wrinkling process. First, one has to observe how the original cabinet and panel were painted. Since the base coat was smooth nitrocellulose lacquer, this will appear as gloss black. Note that all inside surfaces of the cabinet and panel are gloss while the outer surfaces are wrinkle. The outer surfaces was where the catalyst was sprayed. When baked to activate the catalyst, the result was gloss black on the inside and wrinkle finish on the exterior. Before painting, wipe down all of the surfaces with lacquer thinner. This is to remove all grease, oil or other contaminates. To duplicate the original finish appearance, we first have to spray the gloss black lacquer on all of the inside surfaces of the cabinet, the lid support lips and the back of the front panel. On the removable front rail, spray gloss black on the inside surface and only on the lip that supports the lid. Let the gloss black lacquer dry overnight. To do the wrinkle finish successfully you should only do one surface at a time. If you try to paint the entire external surface of the cabinet, you're sure to have a problem heating the entire paint job enough for the wrinkle to appear evenly. Before painting, I set up at least two heat lamps that are nothing more than 100W incandescent lamps with the aluminum bell reflectors as the primary heat source. I also have a handheld heat-gun to apply heat to specific zones that are the usual problem areas - like edges or corners. I apply the wrinkle paint in at least four heavy coats with about one minute waiting time between each coat. Each coat is applied in a different direction to avoid a "striped" pattern. Once the surface is painted, it is placed it under the lamps. After about five minutes, I start using the heat-gun to generally heat the entire surface but to also heat areas that aren't receiving a lot of heat from the lamps. I usually will apply the heat-gun from underneath of the painted surface because too much heat directly onto the wrinkle paint will cause it to "gloss" and not match the texture. I always keep the heat-gun moving to keep the heat distributed and to avoid burning the paint. After a few minutes, the wrinkle pattern will begin and then, using the heat-gun, I apply heat just ahead of the pattern to move it along. The entire surface should be wrinkled in about ten minutes total time. Now, I move on to the next surface. At the edges, I shoot the paint from over the surface being painted rather than from the opposite side. That way the edges will blend and not have an "over lap" of paint that won't match correctly. When I do the top lid, I set it up so that the lid is down on the supporting lips. That way, the gloss black will be protected from the wrinkle finish and the end result will look like the original application did - see photo below. The wrinkle finish is very, very soft at first so it's best to avoid any contact with the wrinkle finish "surface." I have to move the pieces carefully as I set up to shoot each side. When the painting is finished, I'll let all the pieces cool down for awhile. It's best to let everything set undisturbed for about one hour. After an hour, the wrinkle has set up enough to handle and move the pieces indoors but the wrinkle finish will take about two days to develop it's hard, durable surface. The longer it ages, the harder it gets. Avoid mounting anything to the wrinkle finished surface for at least two days. photo left: The cabinet and panel after painting with VHT Hi-Temp Black Wrinkle Finish. Note that the hole for the non-original pilot lamp has been filled. This hole was actually "welded" to fill the hole. Additionally, the lid finger lift has been reformed. Since E-50 was once mounted in a rack, the lid finger lift had been "flattened" for rack clearance. 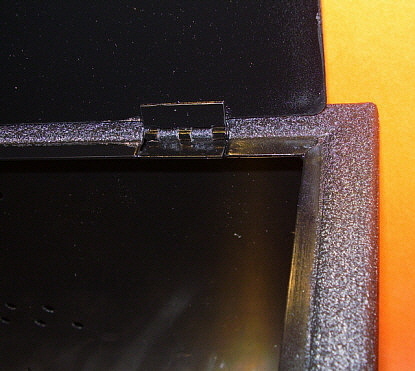 photo right: This is a close-up showing the detail of the lid support lips. Note that on the support section the paint is smooth gloss black while the top edge is wrinkle finish. Also note that the interior of the cabinet and the bottom of the lid are also gloss black. Replicating the S-Meter - Close study of a photo sent to me by K6GLH of his "E-run" HRO allowed me to see how the unique E-run S-meter looked. I found that the same meter was used on the RME-69 and I had a parts set '69 that could provide the proper meter. The next step was to replicate the scale. I used the original scale from the S-meter in D-65 to make a copy on photographic paper. The photo-paper results in a slight gloss to the scale. The DCR of the HRO meter is 35 ohms and the RME meter is 32 ohms. The RME meter movement works fine for the early HRO receiver. Replicating the Pearl Button Switch - I tried to paint an old ivory push button switch with Revlon Perfect Pearl fingernail polish. The Revlon "paint" never looked correct so I was looking for an original pearl button switch. Paper Capacitor Update - A thorough examination of HRO D-65 has lead me to believe that all early HRO receivers came with Micamold brand paper caps. D-65 has 15 Micamolds with the remaining 6 caps being mostly Sprague (one Tobe.) E-50 has 5 Micamolds remaining but E-50 has an extensive repair history. It's unlikely that so many Micamolds would turn up in two different HROs unless they were original caps. A check of the underchassis photo from the 1935 and 1936 HRO manuals is clear enough to read the "Micamold" logo on the capacitors in that receiver which seems to confirm that they are the original brand used. Nickel Plating the PW-D - I thought I might be able to create an early style nickel plated PW-D by using a later painted PW-D. The painted dial is slightly different with thicker index lines on the outer dial and thicker numbers on the inner dial but with the correct color coming from the plating, these slight differences wouldn't be objectionable. Nickel plating generally should be done over copper plating or brass. I had to try to nickel plate pot metal. I've plated aluminum with no problems, so I thought the pot metal would do okay. Well, the first attempt turned splotchy and dark, a sure indication that too much current was being used for the electroplating. The second attempt, at reduced current, also turned dark. >>> >>> The third attempt reduced the current even more and the results were okay. There was still some splotching but overall the dial looked close to original. I felt that the plating might have turned out better had I used a different kind of anode. I was using pure nickel for the anode and I'm pretty sure the original PW-D dials were German Silver plated. Maybe I'll use a nickel coin next time for the anode. I think the best solution would be to find an original plated PW-D dial for E-50. All of the work described in the above sections was done while I was living in Virginia City. The 2012 move to Dayton, Nevada certainly seemed to stop this project for awhile. Original PW-D Found - Finally, after over two years of "keeping an eye out" for a nice condition German Silver PW-D, one has turned up. I fitted this correct PW-D to E-50 and also installed the correct red "NC" diamond to the pointer and the transformation was stunning. What a difference an original German Silver PW-D makes. Sometime later, I was going thru some junk and ran across a Supreme Diagnometer that happened to have the exact pearl push-button that was also used in the early HROs. I swapped the ivory (painted pearl) push-button that had been in E-50 for the "real" pearl button in November 2016. UPDATE: NOV. 2016 - Just so readers know that I am still interested in finishing E-50, I recently found a correct "short boss" RF Gain knob for E-50. I've also found a roll of the correct wire with black cloth insulation for replacement of some of the wiring. An original-type pearl push button is installed and the S-meter scale is now the correct, early-style scale. photo above: E-50 as it looks as of Nov. 2016. To get restarted, I stripped out all non-original components and non-original wire. This allowed me to see that about 75% of the wiring was original and the majority of resistors were the correct National type. Only five of the capacitors were Micamolds. I still haven't exactly worked out how to get the paper shell to look like a Micamold but I think orange paper labels made from copying the original Micamold labels might work. Experimentation will be necessary when we get to that part of the restoration work. As a last resort, I could use Sprague shells since National went to that brand in 1936. Using a Wiring Model - The easiest and quickest way to determine what is original and what isn't is to compare E-50 to another early HRO receiver. Additionally, the 1936 HRO manual has a very good under-chassis photo that provides another look at the early wiring of HRO receivers. The schematic and parts list can also be used for confirmation of component values and hookup. So, with both receivers upside-down on the bench, the restoration of E-50 could get underway. Wire - Almost all the hook-up wire in an HRO receiver is black cloth-covered stranded wire that is about 18 gauge. Since I had pulled the harness out intact for the chassis repaint, most of the original wires that were left went back into the chassis as a semi-complete harness. This meant that the tube heaters and many other wires were already present and connected correctly. All that was needed was to replace non-original, replacement wiring and to install missing wires. There were two non-original tube sockets that were mods from the past. I had replaced these with original National ceramic sockets. I was able to use the original heater wiring to connect up these sockets. Assemblies - Since the IF transformers, the BFO assembly, the Crystal Filter assembly, Audio Gain pot, S-meter and S-meter switch had to all be removed for the chassis restoration, these assemblies needed to be connected back into the circuit. These components do provide some of the wires that aren't black cloth insulated. 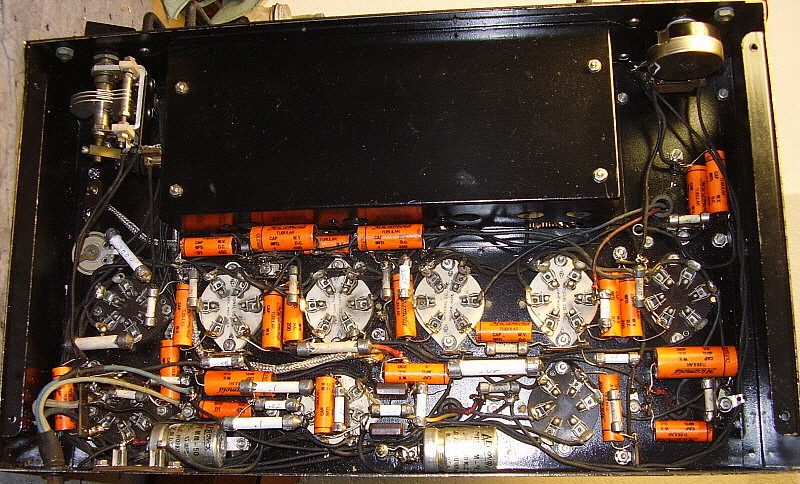 Once the chassis mounted component-assemblies were connected into the circuit the next step was to replace non-original wires and missing wires with duplicate of original black cloth insulated wire. Replicating National Hook-up Wire - The old wire roll I had looked very close to the National HRO hook-up wire except the wire itself was solid conductor where the original National wire is stranded. When I needed an original-type wire I would measure the length needed and then strip off that length of cloth insulation from the solid conductor wire. Next, I would cut a slightly longer length of modern 20 gauge stranded wire and feed it thru the cloth insulation with the 20 gauge wire insulation not removed. Once the wire was thru the cloth insulation, about one inch of the modern insulation was removed on each end. Then the cloth insulation was pulled tight around the modern wire by pulling it thru my fingers. This results in the wire looking like National-correct stranded hook-up wire but with old black cloth insulation over modern insulation that can't be seen. Each time I needed an original-looking wire this process had to be used to create a wire that would have the correct under-chassis appearance. I was able to nearly complete the under-chassis wiring by this method and the appearance is authentic. More Parts Turn up for E-50 - Oct. 13, 2018 - I received an e-mail from collector Terry N3GTE who had an early style D coil set that he wanted to trade for a late-thirties type D coil set. I went through the spare coil sets and found a decent D coil set that tested good and looked presentable but could still use cleaning and new chart covers. We each sent our trades out and the early D coil set arrived here a week later. This now gives E-50 three coil sets, B, C & D. Still need to find an early style A coil set to have the complete (standard) frequency coverage. I went over to KB6SCO's storage unit on October 13th and was helping him clear out some junk. John gave me a cigar box that was "filled" (literally) with nothing but leaded-end resistors. About half of them were white ceramic with blue ink "hand-written" values while the rest were painted color-coded or paper labels over the white ceramic body. Just what I needed to complete the restoration of E-50. The next work session on E-50 should complete the restoration. I've decided to just replicate the Micamolds as close as I can by building them by using salvaged paper capacitor shells and covering the shells with replica (well,...close copies) orange paper "Micamold" labels. Sounds bad but should look good,...I think. The resistors hopefully can be found in the cigar box but if the values needed aren't there then the leaded-ends can be used to make correct value replicas. More details when the work gets started again in a couple of months - winter project. Back at E-50 - November 26, 2018 - Winter was early! Sorted thru the ceramic resistors to find the values needed. Ten resistors were needed. Found one that would work. The remaining missing resistors will need to have replicas made. I use defective ceramic leaded-end resistors and remove the ends. These are installed on IRC type carbons that are the correct value and approximately the same physical size as the original ceramic body. Then the new resistor body is painted white. Looks good from a distance and works fine. The procedure is covered in the restoration write-up on HRO SN: H-103 above. Finished up installing the few remaining wires that were missing. Also completed the connections to the 'phone jack and to the S-meter and S-meter push button switch. November 29, 2018 - After carefully checking values only two of the ceramic resistors can be used. I went thru my vintage IRC carbon resistors to find the correct resistances necessary and that the resistor was the correct dissipation so it would be the proper physical size. All values required were found and double-checked using a DMM. I salvaged the required leaded-ends from defective ceramic resistors first and the remaining were salvaged from ceramic resistors that were duplicates of unusable values. Finished building the nine ceramic leaded-end resistors Dec 1st. Ended up needing to build three more leaded-end resistors (besides the nine) to complete the circuit - total of 12 needed. December 2, 2018 - Different Circuit Wiring? - I ran into a difference between the wiring of the 2B7 tube in H-103 and the early version manual schematic I'm using. It involved the 1st AF Amp tube biasing and the AF Gain control wiring. My thought was that certainly the D-run receivers are wired as the early version schematic and probably the circuit wasn't revised until mid-E run at the earliest. However, I pulled the bottom covers on both HROs D-65 and on F-16. I found both receivers were wired just like H-103,...hmmmm. It's likely that D-65 had been sent back to National for upgrading around 1937 and the 2B7 wiring upgraded at that time resulting in the stock-original appearance of the rework. F-16 wiring appears to be original. Finally, I happened to remember that D-76 was up for auction on eBay. I took a look and the seller did have a good photo of the under chassis. Obvious was the early wiring of the 2B7 in D-76. So, it seems that National changed the 2B7 wiring by run-F but, although it's hard to imagine, National didn't change the schematic or photos in their manuals until after run-N. I initially thought I'd go ahead and wire E-50 per the early schematic. But, a closer inspection of E-50 revealed that the amount of rework involved (taking out some of the wiring I had already installed) would be substantial for such a minor deviation in the circuit wiring. I decided to go with the later version schematic for the 2B7 wiring and leave the wiring that I had already finished installed. Dec 4, 2018 - Discovered that I hadn't installed the B+ wire to the LO. This was because on H-103 the wire running under some components. When using D-65 as the reference, the missing wire in E-50 was pretty obvious. Also needed another wire that connected the 800 ohm resistor to the 2B7 cathode. I had to rob the 100pf, 250pf and 500pf mica capacitors out of a HRO "parts set" to install these components into E-50. I also had to replace the LO grid leak resistor and make a 20K leaded-end resistor for that component. All leaded-end resistors and mica capacitors are now installed. The next step is recreating the Micamold paper capacitors. I have created the artwork for Micamold paper labels using the computer. I plan on printing the labels (probably a few per page) on orange colored paper. These will then be cut out and applied to vintage paper capacitor shells. Then a new capacitor installed in the shell and the whole assembly covered with bee's wax. This isn't how the original Micamolds were made - they used the "rolled end" method and their caps weren't wax coated. But, I think the end result will look pretty authentic and at least the caps will have "Micamold" on the label. I might try dipping the assembled replica capacitor into yellow-tinted lacquer as see if that looks more like the original Micamold caps. But, if that doesn't work out, then there's still the bee's wax option. Dec 6, 2018 - Pulled from "stock" the new capacitors needed. 14 - 0.1uf-600vdc, 7 - 0.01uf-600vdc and one .22uf-600vdc. These are polyethylene dielectric types and all of the caps are rated at 630vdc. Their small size allows insertion into vintage paper shells. I also had to account for C7 being listed as the wrong value in the parts list. It's listed as 0.1uf-200vdc but it should be 0.01uf-400vdc. This subtracts one .1uf 200vdc from the parts list and adds one .01uf 400vdc to the list totals. Although all of the caps used will be 630vdc rated, the replica labels will have the original values shown. I'm using all vintage late-thirties Zenith Radio Company capacitor shells. No particular reason other than that I have a lot of them and they are orange. When finished, the replica Micamold caps will look moderately authentic. Dec 8, 2018 - Fine tuned the capacitor artwork for best paper use. I had to do a "cut and paste" in order to have the "OUTSIDE FOIL" and indicating line to be perpendicular to the Micamold logo and the capacitor values. I ended up with four masters for the four different values of capacitors used in the HRO. Dec 9, 2018 - Made all of the Micamold labels needed. 11 - .1uf 200wvdc, 3 - .1uf 400wvdc, 7 - .01uf 400wvdc and 1 - .25uf 400wvdc. The artwork was copied onto orange paper with three labels per sheet except for the seventh .01uf 400vdc and the one .25uf which used a single sheet of orange paper each. Next was to melt-out all of the old capacitors from the Zenith shells. That process took about 30 minutes. The capacitor wax is melted using a heat gun. I use long needle-nose pliers to hold the cap by one lead end and heat it up until the wax runs off into a metal wastepaper basket. Then the shell can be pulled off and the junk cap insides dropped into the basket. Then the shell is wiped down with a paper towel to remove as much wax as possible. This has to be done quickly while the shell is still hot. The shells, the repro labels and the new capacitors were all sorted into plastic bags to keep everything straight and in order. Dec 11, 2018 - Stuffed all cap shells with proper poly caps. Secured new caps inside shells using hot melt glue. Then the cap shell ends are filled with dark brown sealing wax. This process goes along pretty quickly because I'm essentially making new capacitors rather than removing an old cap from a receiver, rebuilding it and then reinstalling. Probably took about an hour and a half to stuff 22 capacitors. Dec 12, 2018 - Glued replica labels on 16 of the capacitors using 3M spray glue. On the .25uf 400vdc, the three .1uf 400vdc and the six .01uf 400vdc,...these labels were sprayed with yellow-tinted lacquer to seal the paper and give a darker color with a slight sheen. On a few of the labels the lacquer caused the seam to lift a bit. I just re-glued the seam to correct. The photo left shows all sides of the replica Micamold lables. Although the actual Micamold logo has an elaborate flag-like underline, this representation is similar. The values and address are very close to how the original Micamold caps looked. The capacitors had two coats of amber-tinted nitrocellulose lacquer sprayed on them to replicate the color and the sheen of the original capacitor labels. The finished capacitors look vintage and have the appearance of the authentic Micamold brand capacitors used in early HRO receivers. Dec 14, 2018 - Finished installing all of the replica Micamold capacitors. Installed power cable. Rechecked all of the solder joints and wiring. Found a complete set of 2.5vac filament tubes - 4 - type 58, 3 - type 57, 1 - type 2B7 and 1 - type 2A5. Tested all of the tubes to ensure they were all functional. Installed the tubes into E-50. E-50 is now ready to test. Dec 15, 2018 - Before applying power to E-50 I checked the DC resistance of the B+ just to make sure there were no shorts or very low resistances. The B+ resistance to ground was in excess of 10K which is okay. I connected up the 5897AB to E-50 and connected a MCS-8 speaker. I just used a six foot wire for an antenna. I flipped on the switch on the power supply and saw that the tube filaments were beginning to light up. Within about 30 seconds I could hear that E-50 was receiving something. I had the C coil installed and it was set for general coverage. At around 480 I heard a British Columbia ham on CW. I decided to connect up the regular ham antenna adjusted for 40M. I was able to hear several hams on both CW and SSB. I tweaked the IF a bit and signals were stronger. Now, E-50 at this moment has not been aligned. The coil sets haven't been aligned. But, right off E-50 is working pretty well. More details after the alignment. IF Alignment - I rough aligned to 456kc first to see that everything did adjust. I then "rang" the crystal frequency and found it to be 455.7kc. I then aligned the IF again to this frequency. This assures that the crystal filter will function correctly. I also aligned the BFO to zero beat at "6" on the CW OSC scale of the knob. This allows selecting either sideband of a signal. This completed the IF alignment. RF Alignment - Coil set C adjusted with no problems. This coil set is an "F" prefix serial number and, while still an early coil set with white charts, it does have the larger contacts that started with the F-run. Coil set B was an early coil set with the small contacts but it did align with no specific problems. Checked D coil set, aligned, already pretty close. Worked well, listened to Pacific NW AM hams. photo right: looking into the cabinet with the lid up shows the top of the chassis details of E-50. All aluminum pieces were treated with Sodium Hydroxide (Easy Off Oven Cleaner) to clean and then impart the matte finish to the metal surface. The tuning condenser was totally removed when the chassis was restored and repainted. At that time, the condenser was thoroughly cleaned, detailed and adjusted. The gold finish on the crystal filter housing was accomplished using amber-tinted lacquer. Note the interior of the cabinet is gloss black as is the lip around the top opening while the exterior of the cabinet is wrinkle finish. S-meter Problem - doesn't adjust and is "pegged" at FS when the button is pressed. Just to be sure that this meter (it came out of a junk RME-69) would work, I measured the DCR of the meter coil at 34 ohms. I then measured D-65's meter coil at 32 ohms. Close enough. Rechecked wiring and found that there was an error in how the push button switch was wired but correcting this didn't solve the problem. The meter movement is dependent on the plate current in the AVC controlled stages. The plate current is dependent to some extent on the value of the cathode resistors. The 1st RF cathode resistor should be 300 ohms but it was 1.2K. The 2nd RF should be 300 ohms but was 390 ohms (not bad.) The 1st IF 300 ohm was 490 ohms and the 2nd IF 300 ohm was 450 ohms (pretty far out.) Replacing the 1st RF cathode R helped. I later replaced all of the 300 cathode resistors with rebuilt white ceramics using 330 ohm CC resistors with leaded ends installed. In the later HRO manuals the values of the two S-meter bridge resistors are listed as anywhere from 200 ohms to 2500 ohms implying that they were selected during test. The values of the bridge resistors will determine the current through the S-meter. I checked H-103 and found the bridge resistors were 1.2K. I paralleled some 3.3K resistors to result in 1.2K for the bridge resistors but this still didn't correct the problem. Further checking found the problem. The screen voltage bleeder resistor R15 had been marked as a 100K (in blue ink) and when I checked its value it was around 100K so I thought it was okay. When checking the schematic closer, I saw that the value of R15 should have been 30K. I lifted one end of the resistor that was installed and it actually measured open. Luckily, in the cigar box of leaded-end resistors I found a 30K original that I then installed. This got the S-meter working correctly. The values of the bridge resistors actually function better at 1.2K as that allows the RF Gain to be fully advanced and the S-meter can still be set to zero. With the original 2K value, the RF Gain can't be set higher than 9.5 before the S-meter can't be adjusted to zero. I built two leaded-end resistors with the value of 1300 ohms and installed these for the two S-meter bridge resistors. Now the RF Gain can be fully advanced and the S-meter can be adjusted to zero. A few things I'd do differently,...I wouldn't use "fake rivets" as I did on E-50. The original style rivets are available and the setting tools are also available and both are easy purchases on eBay. I do wrinkle finish a little differently now and I think that would have produced a "deeper" texture. I think I should have given the chassis more coats of lacquer. The originals seem to have very thick coats of paint. But, I think E-50 turned out great and it works very well. The total time was just over seven years! That's a long time for a restoration, but I wanted to use original parts for those that were missing and locating originals just takes whatever time it's going to take. I didn't do any advertising for parts, I just waited until what I needed turned up. I could have reduced the time by advertising but things like a "good condition, nickel-plated PW-D," or a "small red <NC> dial pointer" are hard to describe to "non-enthusiasts" when advertising for parts. Update: Dec 22, 2018 - In going through all of the spare coil sets, I found an A coil for E-50. It's not the earliest type but is one from 1936 with a "J" prefix serial number. I replaced the black background charts with copies of the white background charts for an A coil. Tested the A coil set's operation in E-50 but, as would be expected, the coil set needed to be aligned to the receiver. Afterwards, E-50 was receiving SW BC stations around 15.3mc quite well. I'll keep watching for an early, small contact, coil set for A and also for coil C. E-50 has small contact D and B coils sets but coil sets A and C are large contact, later types. "Detailing" is where a few minor things need to be done to a receiver but a full restoration isn't necessary. Cleaning, servicing and alignment is required. Sometimes minor cosmetic corrections are required. Detailing doesn't require replacing capacitors or other components other than perhaps a few defective tubes. F-16 was that type of receiver. It was in good shape but certain things were incorrect. The following write-up covers what was needed to transform F-16 into a very nice condition (but not exactly original) early rack mount HRO receiver. The Problems - HRO F-16 originally came from National as a table model receiver. Somewhere along the line, it was converted to a rack mount receiver. It wasn't sent back to National for the conversion. My guess is that a former owner was able to find a rack front panel and then decided to do the conversion himself. 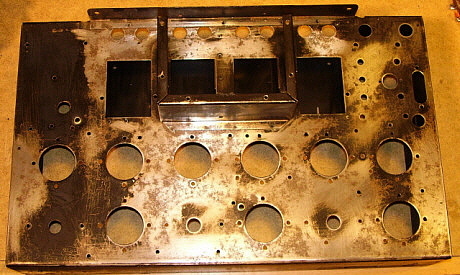 This isn't difficult to accomplish since all of the holes match and only the proper mounting hardware for the mounting would be necessary (it appears they were obtained along with the panel.) 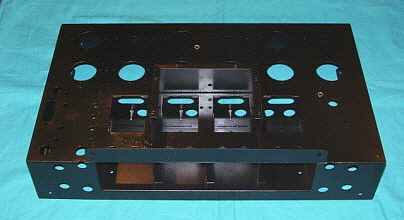 Rack mount receiver panels were painted black crackle finish (National called it leatherette.) Since just the rack panel was changed, all of the "matching serial number" coil sets still had their original wrinkle finish panels. Additionally, the S-meter didn't fit correctly since the rack panel was of a later vintage. The meter mounting holes were utilized to hold the original S-meter to the panel by the rim of its flange. When the panel was changed to a rack mount type, the original table cabinet became the dust cover. Since it had been a table top, the lid had the finger lift projection. Rack mounts had flat lids to allow the receiver to be installed into the tight spaces of some rack installations. That was the cosmetic issues. The electronics were typical of an old receiver that had been used up to the 1960s but never restored. The original capacitors had been replaced around 1960 using Sprague molded types with the red nomenclature, not black beauties (but similar.) The resistors were mostly original but many had small carbon resistors added in parallel to "trim" the value back to the proper resistance. There were no "cut and hack" modifications. photo above: F-16 shown with its homebrew, rack mount, spare coil storage box F-16 was a good example of a receiver that was "well taken care of." The former owner must have liked how the receiver performed and therefore maintained it in working condition. In fact, the former owner built an impressive, custom rack mount spare coil storage box with "lift up" front cover. It's entirely made out of plywood and masonite. The exterior is painted black. It stores five coil sets. F-16 has its four original A, B, C and D coil sets plus E and F coils sets that must have been acquired later. It was obvious that F-16 had been in storage for quite a while. Some surface corrosion was visible on a few parts but mostly the chassis was covered with lots of grease and dust. Another problem was the heavy glue residue from two stickers that was left on the front panel. With a little electronic cleaning and testing, I had F-16 working quite well. I suspected that the good quality capacitors from 1960 would probably still function. I listened to the receiver for a few weeks to see what the reliability of the somewhat vintage components would be. No problems were encountered. Even the "as-found" alignment was very good. 1. Replace wrinkle finish coil set panels with crackle finish coil set panels on A, B, C and D. White frequency charts will also have to be transferred to the crackle finish panels. 2. Replicate a typical meter clamp for the original meter to mount correctly. Fill meter mounting holes in the front panel. Shim the meter to fit the panel hole correctly. 3. Clean front panel of label adhesive residue and then recondition the front panel paint. 4. Flatten the finger-lift projection to create a rack mount type dust cover. Crackle Finish Coil Set Panels - I had a complete spare set of black leatherette finish coil panels that were mismatched to a 1936 table model HRO receiver. By exchanging panels on the two complete coil sets, I could have F-16 original coils assemblies installed on crackle finish panels. The excellent wrinkle finish panels would then be used to create a "matched set" of P-run coils that would be aligned for H-103 giving that HRO a very nice set of "matched" coils. The exchange is easy to accomplish although it's a little time consuming. First, all of the individual coil shielded assemblies are removed from their respective panels. Four coil assemblies for each panel. This only requires loosening the mounting screws. Then the coil frequency charts are removed and the coil panels cleaned and touched-up as necessary. Then the proper charts are installed onto the correct panels. Then the correct shielded coil assemblies are mounted to their new respective panels. It takes a couple of hours to do the exchange with cleaning taking up most of the time spent. Meter Clamp - I made the meter clamp out of a 1.25" wide strip of .030" aluminum. I notched the metal strip along one side and bent the resulting tabs at a 45 degree angle. I then bent the aluminum around a form that was the same size as the meter housing. I bent two 90 degree end tabs and drilled a hole in those tabs. This was to allow a 6-32 screw and nut to tighten the clamp onto the meter housing. I aligned the tabs to make sure that all were contacting a flat surface. I then painted the clamp black. Installation was to install the meter from the front of the panel and the clamp onto the meter body. Push the clamp all the way forward and tighten the screw to secure. Like all of the vintage clamps, this one doesn't keep the meter so tight that it can't be turned in the mounting hole. It keeps the meter secure and that's all the vintage ones did. Meter Shim - The easiest method to shim the .030" clearance was to use friction tape that was cut to about .190" wide. This was wrapped around the meter body up next to the flange. About four wraps allowed the meter a good, secure fit into the mounting hole. Filling the Meter Mounting Holes - The easiest method is to use 5 minute epoxy as the filler. I used masking tape on the front panel to cover the holes. I then fill the holes with epoxy from the back of the panel. The tape assures that on the front of the panel the hole fills will have an absolutely flat surface. After the epoxy has set up, I remove the tape. On the back of the panel, I use a razor blade to "shave" the top of the epoxy fill so that it is flat. The front and rear surfaces of the fills are then painted using black nitrocellulose lacquer to match the original paint. 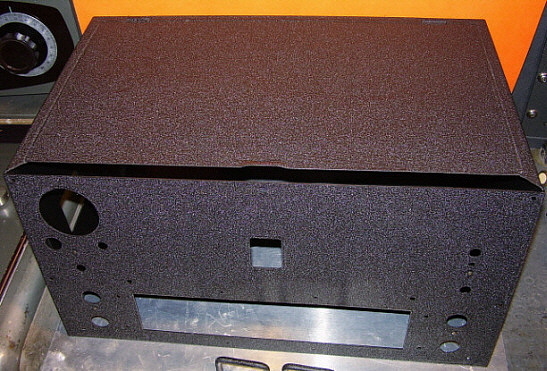 Removal of the Finger Lift - Rack mount HRO receivers have a flat lid on the dust cover/cabinet. This was to allow easy installation of the receiver into a "crowded" rack. Removal of the lid finger lift project first required removal of the dust cover from the receiver. Then I had to use some padding to protect the paint. I used heavy paper and inserted the lid into a very large vise that had brass jaw covers. Tightening the vise flattened the finger lift most of the way. To really get the area straight and flat required "body work." That is using a hammer and wooden protectors to allow the metal to assume a straight line. Since there was some distortion in the metal when the projection was formed, it won't reassume a flat shape now. I had to file the front edge somewhat to get it straight. The entire process took about 25 minutes to accomplish. Afterwards, I touched up the area with black nitrocellulose lacquer in combination with Mars Black acrylic paint to achieve the texture. Cleaning PW-D Index Dial and Knob Skirts - The knob skirts are German Silver which is essentially nickel with a small amount of bronze in the form of copper and tin. Generally, brass, which is bronze mixed with steel, will not scratch nickel unless a lot of pressure is involved in the contact. I used a "new-unused" brass brush in combination with lots of Glass Plus to clean the knob skirts. Whatever was on the skirts resisted normal cleaning using either WD-40 or Glass Plus. By lightly brushing the Glass Plus with the brass brush, the yellow (probably nicotine) was easily removed without scratching the skirt. The end result was the flat silver finish that is correct for the knob skirts. The same yellow discoloration was on the PW-D. This dial is German Silver plated, so you have to be careful. I disassembled the PW-D so I was only working with the Index dial. Again, lots of Glass Plus and a very light touch with the brass brush removed the yellow contaminate and left the Index Dial the correct flat silver finish. Be sure to test the reaction of the brass brush and the German Silver. In my experience, the brass seems to be a little softer so it doesn't scratch. But, brass brushes may vary in the type of brass used for the bristles. Some brass has a lot of steel in it and that might make it hard enough to scratch German Silver. Test on the back side of a knob skirt first. Photo right shows F-16 after the detailing. 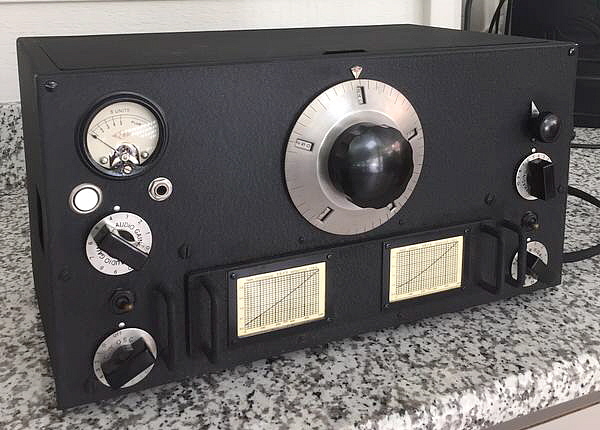 HRO SN: E-76 - Paul, W9AC, has recently finished his restoration of this second production run HRO SN: E-76 and the results are spectacular. Performance was improved in the LO section by adding a Collins silver mica 10pf NPO capacitor as the tuning condenser coupling capacitor and by adding zener regulation to the LO itself. Also, from Loren Windom in a 1940s QST article, some minor modifications to the LO section. The end result is a reduction of thermal drift and stability of the tuned signal when the RF gain control is adjusted. Paul also owns a first production run HRO with the SN: D-49. HRO SN: F-09 - This early third production run HRO is in excellent condition and has its original coils (six of them) along with the coil box and the power supply. Note that the "NC" pointer retainer screw is still being used at run-F along with the white graphs but the pilot lamp is installed as is the pull switch for the S-meter. The S-meter scale is the second type used with the orange <NC> with black letters. Also "PLUS" was eliminated with this scale variation that was used from run-F up to run-H. A very nice original HRO owned by K4OZY. HRO SN: G-235 - This early HRO is owned by Greg, K6SRO. It dates from July 1935 and includes the matching coil sets in the National wooden box. The meter is the 1-5 scale, second version meter scale. The Noise Limiter looks like it could be a DIY addition based on the standard National modification or it might be a National supplied kit. Greg is in the process of restoring this great example of the early HRO. Paint Note: The photos of G-235 and of F-09 are particularly good at showing the heavy texture of the early, two-part wrinkle finish that National used on their receivers. Note that there is a secondary pattern that is larger than the primary "wrinkle" pattern. It's unfortunate that the modern, one-part wrinkle finish doesn't duplicate this dual wrinkle texture pattern. You can reference the last photo of E-50 in the Restoration Section above to see what to expect from modern VHT Black Wrinkle Finish, one-part wrinkle finish. 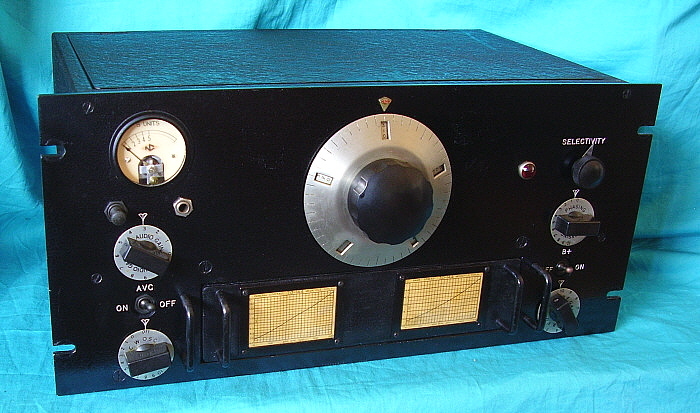 HRO Senior SN: 170-H - This HRO is from Great Britain and dates from about 1940. It is owned by John G3SLX. 170-H is in great original condition and features an unusually heavy texture wrinkle finish paint. Note the plug-in crystal on top of the Crystal Filter. HRO-MX SN: D-706 - This is the WWII version of the HRO dubbed the HRO-MX. This version still has the large six pin glass tubes but many improvements were already incorporated by the time D-706 was built (probably around late 1944 to early 1945.) Note that the serial number uses the "D" prefix which was also assigned to the first HRO production run in 1935, however the number at "706" is much higher than the numbers assigned in the initial "D" run. Also, note that this receiver has the Marion Electric 0-1mA S-meter that was installed on some of the WWII production HROs. This HRO-MX is owned by Marc, GI3YDH, of Northern Ireland. 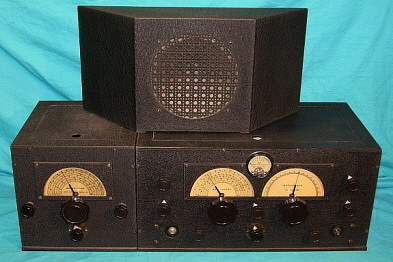 HRO Senior - Modified by Royal Canadian Corps of Signals - In the late thirties or early forties, the Royal Canadian Corps of Signals ordered approximately 200 HRO Senior receivers. * These receivers were modified to what the RCCS needed for their use. The addition of a shield to cover the tuning condenser can just be seen in the photograph to the left. The antenna terminals were replaced with a more robust British version. All controls were labeled using engraved tags mounted with screws. Additionally, a serial number tag was added to the lower part of the front panel. A Hammond audio output transformer was added to the chassis. Three phone jack were added to the front panel. The 2000 Phones was from the plate circuit of the 1st Audio Amplifier, 500 Monitor was from the cathode of the Audio Output tube and 500 Line was from the Hammond transformer. On the rear chassis a phone jack was added that allowed disconnecting the Hammond transformer and connecting a National speaker box or any other speaker that had an internal output transformer. There are other minor modifications to the back of the S-meter and the toggle switch replacement for the pull switch for S-meter disable. This RCCS modified HRO Senior belongs to Fred Archibald VE1FA, who has seen six other examples of this version of the HRO. Several versions were seen at swap meets in Canada and a couple have shown up on eBay. Photo provided by Fred Archibald VE1FA. * Tom Brent reports that in 1975 Fair Radio Sales offered (on the front page of their catalog) these receivers "in the wooden crate as refurbished by the Canadian government" for the price of $125 with five coil sets included but no power supply. This information explains why so many of these RCCS HRO Senior receivers are found supplied with later HRO-5 type coil sets. The Early Competition - To say that there was no receiver that came close to the National HRO performance in 1935 is not an exaggeration. 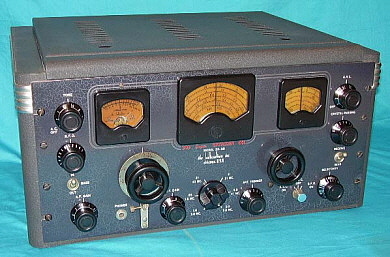 The competition consisted of the Hammarlund Comet Pro - a receiver that was designed before the AGS and didn't have an RF amplifier or any sort of dial calibration. It was a popular receiver that performed quite well up to the point where images and lack of sensitivity became a problem (around 10 to 12MC.) The fabulous Hammarlund Super-Pro was in its design stages and was still at least a year from release. The Patterson PR-10 was available and with an R-meter along with a 10 tube circuit it was a good receiver but with no RF amplifier, no xtal filter or calibrated dial (other than the BC band) it was limited by images at higher frequencies and QRM everywhere else. At the time, there were various after-market preselectors that could be purchased and used with any of these receivers, providing the necessary RF amplifiers to increase selectivity, sensitivity and reduce images. Radio Manufacturing Engineers had the RME-9D which did have an RF amplifier, R-meter and xtal filter along with direct frequency readout plus bandspread. It was a compact, well built, good performing receiver but suffered with an extremely poor tuning dial design. In November 1935, RME introduced the RME-69, an excellent receiver that corrected the dial problems of its predecessor. Breting had just come out with the Breting "12" and this receiver had a TRF stage in addition to a non-tuned pre-amplifier that was switched in above 7mc. The "12" also had a crystal filter, R-meter, Volume meter and an illuminated, direct readout dial. Except for the lack of bandspread, the "12" had a lot to offer for about $100. In 1935, Hallicrafters was still having their receivers built by contractors and had not offered anything significant at the time although the very successful SX-9 was just about to be released (in late 1935.) RCA was offering the ACR-136 with an RF amp but no xtal filter or bandspread. 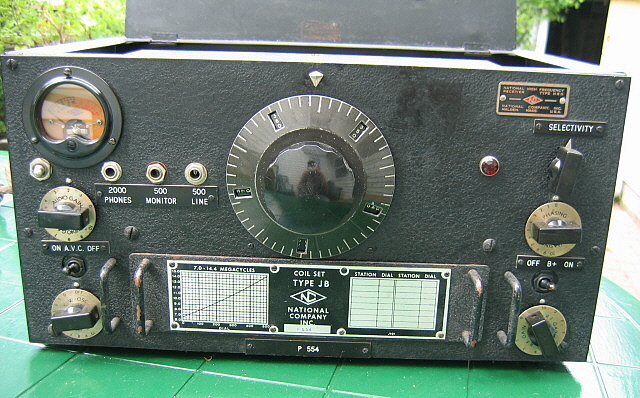 It appears to have been a typical "all-wave" receiver for the SWL. RCA's AR-60 used double preselection on its three highest frequency bands but each receiver was literally "hand-built" and so expensive no ham could afford it ($495 - not to mention that only a few hundred were produced.) The AR-60 was certainly intended only for commercial-military applications. The other receivers from Sargent, Ross or other lesser known builders were generally lacking an RF amp, xtal filter or bandspread. The HRO Design - The HRO was the only 1935 receiver that came with two stages of tuned RF amplification provided on all frequencies. This virtually eliminated images and later became the standard method used in single conversion superheterodynes for image reduction. The use of a plug-in coil module that shielded each coil and itself was installed into a shielded compartment assured that stray losses were not encountered. Connecting the coil set to the tuning condenser via flex finger contacts and short, direct buss wire assured that tuning losses were at the lowest possible. Efficient design of each tube stage, especially the First RF Amplifier, reduced thermal noise and increased the signal to noise ratio. These design factors allow the user to experience the best in sensitivity with low internal noise. Copying very weak signals is standard with the HRO - the signals would not even be heard on some of the other receivers of the time. The other stand-out feature was the incredible bandspread. Though only available on the ham bands 80, 40, 20 and 10 meters, it gave the user unbelievable tuning with the micrometer dial providing the equivalent of nine and a half feet of linear dial for each ham band. Tuning across the ham bands seems to go on and on - it was literally the best bandspread system available. Performance Today - What about the HRO performance today with modern QRN and QRM levels? The HRO is a very sensitive receiver capable of receiving DX signals that would be lost in the noise on other receivers. Of the many types of vintage receivers I've used over a long period of time, I have always found the HRO to be the most consistent great performer when it came to receiving weak DX signals. The HRO is the only vintage receiver that I've used that would receive Russian hams on 20M CW using just a wire antenna (Inv-Vee.) This was in the mid-1970s when most UA/UKs were not running much power and were always just above the noise, even in a then-modern receiver. Additionally, when it comes to QRM, the early HRO crystal filter is quite amazing. It is one of the few crystal filters that will eliminate QRM, even on AM phone operation. By tuning the AM signal "on the nose" with the crystal filter on you will notice just how narrow the bandwidth has become and a slight detuning will decrease the signal significantly. The same is true for CW but these days there is little CW activity, let alone CW QRM. 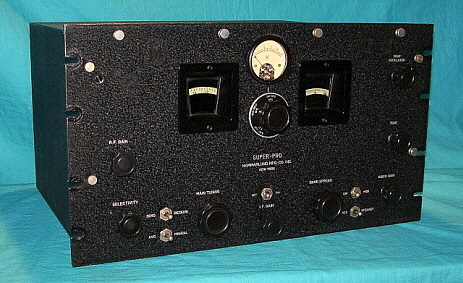 The Hammarlund Super-Pro was introduced in March 1936 (for the civilian market) as a high performance, professional receiver. It is a great receiver that was built to a high quality standard and performed quite well. The Super-Pro had variable coupled IFs, high fidelity audio, accurate direct frequency readout. It also used double preselection on all bands and used a separate power supply. The only complaints heard regarding the Super-Pro is limited frequency coverage (this is for the X and LX versions though, the SX covered 160M to 10M), high front-end tube noise masking weak signals (mostly due to improper antennas) and non-calibrated bandspread dial (it was a commercial receiver, too.) In actual use, the Super-Pro is an excellent receiver with great audio but if you are looking for weak DX signals, you will have to use a matched antenna. Hammarlund expected the user to operate the receiver into a matched antenna system and did not provide an antenna trimmer adjustment. On the audio side of things, the Super-Pro has 14 watts of high fidelity audio available and it can sound incredible when the speaker is matched to the audio output Z. The Super-Pro has the power to drive the speaker to a thunderous volume. Certainly a rebuilt Super-Pro will perform as well as a rebuilt HRO in almost every type of reception. Separate power supply and speaker are the required accessories. Photo shows the 1936 SP-10 version of the Hammarlund Super-Pro. 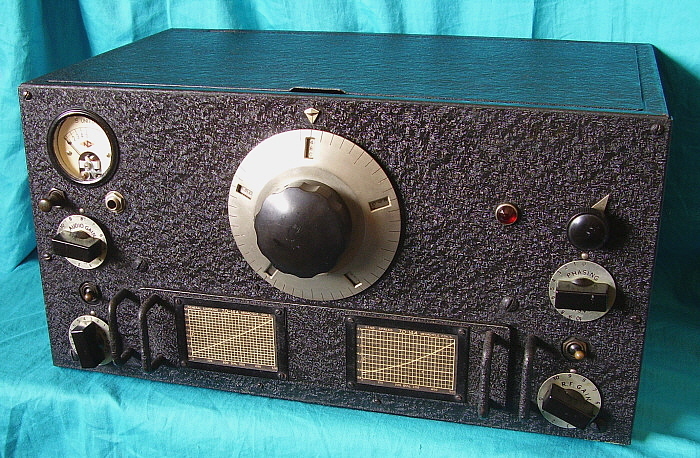 Radio Manufacturing Engineer's RME-69 was another great performer that was a contemporary of the HRO. When used with the matching DB-20 Preselector, the RME-69 has three tuned RF amplifiers and is capable of impressive results. The bandspread is not calibrated but it has an ultra-smooth vernier effect. The built-in power supply is handy as is bandswitching the six tuning ranges. The dial nomenclature is miniscule and difficult to read but the dial illumination is great. The audio is single-ended and sounds pretty good driving a matched speaker. While you could get very good results with the RME-69/DB-20 combination, just the RME-69 alone is a rather anemic performer. The build-quality the RME-69 is certainly far below the HRO with extensive use of compression trimmers for adjustments, even using compression trimmers for the LO adjustments. Additionally, the RME doesn't align the RF and Mixer stages but provides a "Trimmer" control on the front panel for peaking the stages for the frequency tuned. Finally, the RME-69 doesn't provide a remote stand-by function. Up to 1937, the RME was priced well below the HRO but when the price increased for the RME-69/DB-20 in 1937, the cost difference compared to the HRO was minimal. 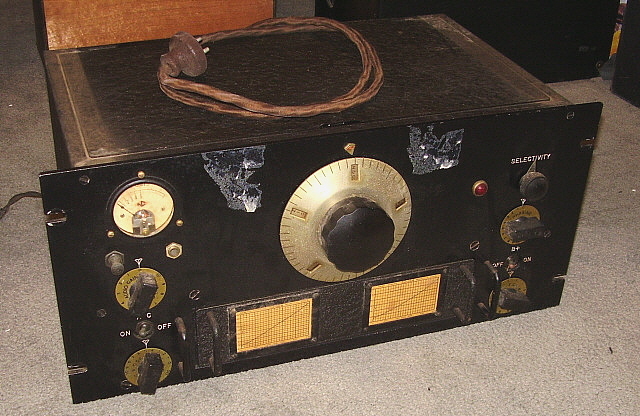 The RME-69/DB-20 only required a speaker for an accessory, maybe its only advantage after 1937. 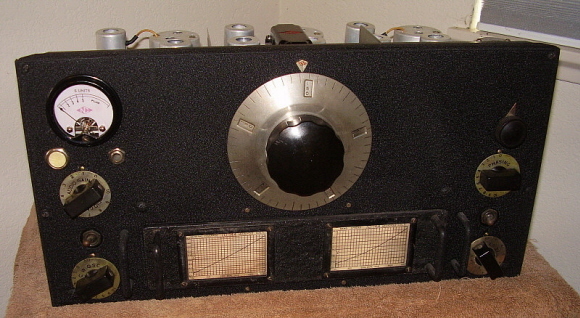 Photo shows the 1937 version of the RME-69/DB-20 with matching RME speaker. 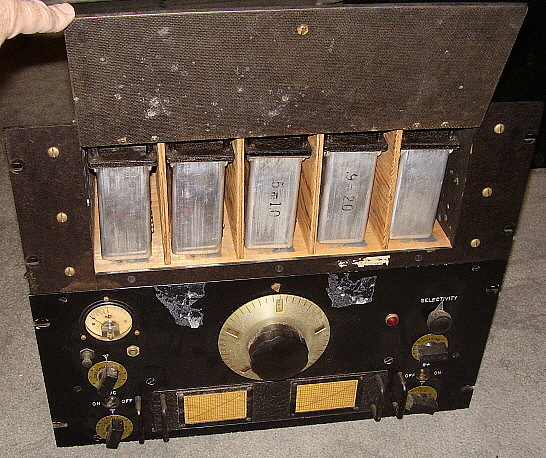 Breting Radio Mfg's Breting 12 - This popular 12-tube receiver became available in 1935. It had a lot going for it and was reasonably priced at $100. Breting 12 receivers tuned from .54mc to 30mc and featured two RF amplifiers, one was tuned and one was an untuned RF pre-amplifier that was switched in above 7mc (the two highest tuning ranges.) 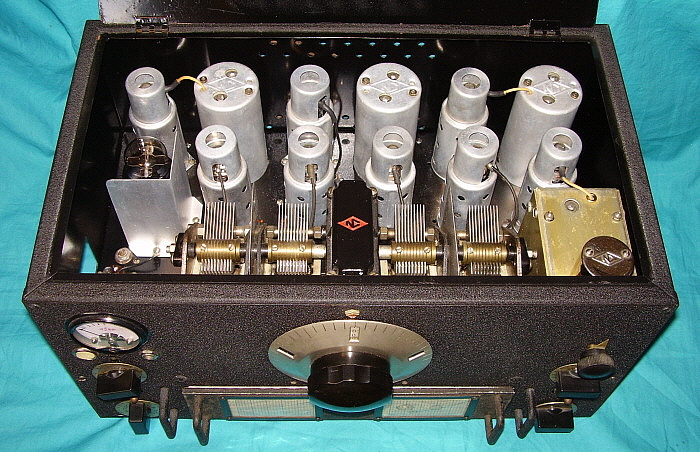 Other features were a Crystal Filter, tertiary-connected IF transformers, R-meter and Volume meter, a switch that allowed the use of the audio stages of the receiver to double as a speech amp for a transmitter modulator, 18 watts of audio output using a triode-connected 42 driver and triode-connected 42s in push-pull. No bandspread was provided, instead the tuning had a large reduction giving a vernier tuning effect. AVC couldn't be switched off. The BFO was electrostatically coupled. No remote standby. All alignment settings used compression trimmers which didn't hold alignment very well. 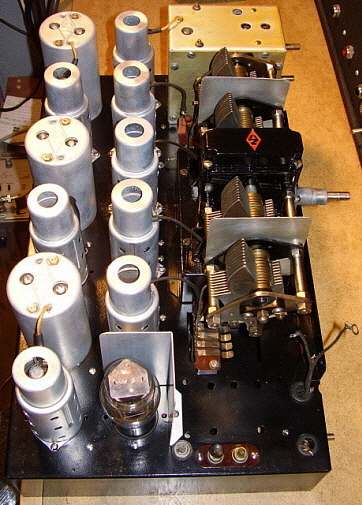 The receiver was built on a chrome plated chassis. Component quality was below average as evidenced by the copious amount of repair work that is usually found inside Breting receivers. Documentation is non-existent and what is available is fraught with errors. Performance, when restored and correctly aligned, is fairly good and the thirties ham owners were certainly able to use the Breting 12 successfully as their station receiver. The HRO was superior in almost every comparison to the Breting 12. However, the audio section of the Breting 12 provided plenty of power with lots of bass. Certainly the $100 price tag (speaker included) for a receiver that didn't require any other accessories was Breting's major attraction to hams. 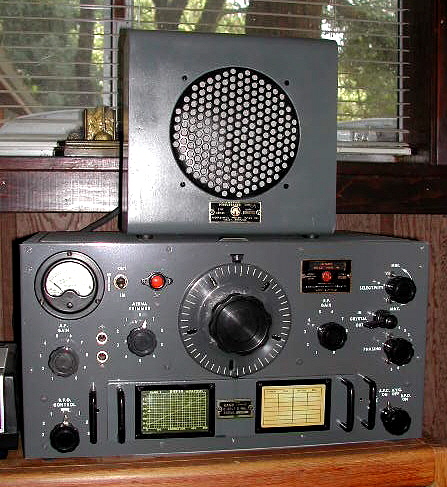 1940 Hallicrafters SX-28 - With five years of receiver development behind it, a rebuilt SX-28 will perform as well as a rebuilt HRO and it also has more features with less accessories. Unfortunately, double preselection is not provided on the SX-28 until band 3, or above about 3.0mc. Hallicrafters insisted that the only reason for two RF amplifiers was image rejection but certainly economics had a lot to do with their opinion. Sensitivity is very good with low thermal noise. While the calibrated bandspread is convenient to use on the SX-28, the "extreme" bandspread that the HRO is capable of seems to be a better system when searching for weak DX signals. The Push-Pull audio on the SX-28 has about 8 watts of power that when driving a matched speaker sounds very impressive with lots of bass and the speaker is the only accessory required. Like the Super-Pro, the SX-28 audio can reach thunderous volume levels. No doubt, the SX-28 will give an HRO serious competition, but when it comes to solid copy of very weak signals, the HRO will beat the SX-28. 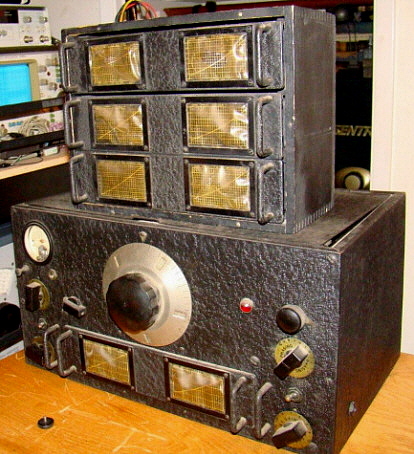 Photo shows the 1940 version of the SX-28. Some hams are reluctant to use a pre-war receiver in actual "on-the-air" operations fearing that adjacent frequency QRM will limit their ability to successfully copy stations and that they will be unable to complete QSOs or Vintage Net operations. However, the HRO (and almost all other high-end, vintage communication receivers) included a couple of "QRM fighting" devices that seem to be rarely used by AM ham operators. The easiest device to use is the HRO's own passband selectivity. For very near-frequency QRM,...if you're in the AM mode and the QRM is from a SSB signal, try tuning "off frequency" a couple of kilocycles from your frequency of operation. You can usually greatly reduce interference and still recover enough audio for decent copy of the AM signal. Usually two or three kc, either above or below the operating frequency, will drop the QRM enough for good copy. The SSB operators will always have filters in their rigs to limit their bandwidth to about 2.1kc. A typical AM signal has about 6kc of bandwidth. Also, the typical AM envelope has the audio information in both sidebands. >>> >>> By tuning above or below your operating frequency, you will be able to receive one AM sideband and usually "drop" the offending SSB signal out of the receiver's passband. This is the method I use most often to "dodge" SSB QRM and it really works quite well on almost any vintage receiver. Depending on the type of QRM, for instance, adjacent signals on both sides of the operating frequency, it might be more advantageous to reduce the HRO bandwidth. Using the Crystal Filter you can narrow the bandwidth down to less than half a kilocycle. It's amazing how narrow the receiver bandwidth can be and still provide decent copy of an AM signal. However, it's very important that you tune the desired AM signal "on the nose" for good copy. Of course the audio will sound "muffled" but it will still be intelligible. Of course the audio fidelity suffers a lot in this mode. But, the goal is successful copy and a completed AM QSO or net operations,...in other words - communications. The Type of Antenna is Important - If the HRO is used with an untuned, random length, end-fed wire, performance results may not be up to the receiver's capabilities (this is true for almost all communications receivers.) End-fed wires without a matching device are notoriously bad antennas - they are actually equally bad on almost all frequencies, so the user thinks the antenna is performing okay since there are no obvious peaks or nulls. However, with an antenna that is tuned for the received frequency, the HRO (and almost all receivers) will perform to its design limits. The HRO doesn't have an antenna trim, so when aligning the coil sets, the 1RF amp coil should be aligned to the station antenna, tuned for the specific band, for best performance. If you are an SWL, then the general coverage set-up should be used and the receiver's 1RF peaked for maximum noise using the regular listening antenna for that coil range. More Alignment Notes - Proper alignment also is important for best performance with any receiver. Though it is possible to find an HRO receiver that is mostly original parts and is functional, it certainly will not be working at its design limits. A full rebuild is usually required for top performance. This is also true for orphan coil sets which might seem to function okay in a rebuilt HRO but full performance capabilities require that the coil set be fully cleaned internally, trimmers should lubricated and the coil set fully aligned to the HRO receiver that it is going to be used in. The original coil set alignment instructions had the user remove the upper front lid support that's held in place with two screws at each end and by the dial pointer mounting screw in the center. This was to allow easy access to the coil trimmers. I've found that if you use a very long and thin blade screw driver with the metal shaft wrapped with tape (to prevent shorting to the condenser frame or the cabinet) all of the coil trimmers are accessible without removal of the upper lid support. >>> The IF is 456kc and the crystal will be very close to this frequency. However, sweeping the signal generator across the IF can determine the exact crystal frequency and this is the frequency that the IF should be aligned to. In fact, your Crystal Filter will function better if you perform the IF alignment with the Crystal Filter on and set for fairly narrow selectivity. This assures that the Crystal Filter is operational and can be a useful tool for combating QRM. Although the manual will recommend that the BFO be set to zero-beat with the control at "9" this is not really necessary and actually reduces the effectiveness of the BFO. In the 30s and 40s the BFO was for CW and upper and lower sidebands don't even exist in that mode. Today we have SSB and by setting the BFO to zero-beat at 6.5 on the scale will allow you to select either upper or lower sideband when receiving SSB. As with all early receivers, the RF Gain must be reduced and the AF Gain set to near maximum with the AVC off and the BFO on to receive SSB signals. You have to set the receiver RF Gain so that the signal to BFO injection ratio is correct for non-distorted SSB reception. Coping with Drift - Drift is just a "fact of life" for early receivers. There is a lot of discussion today for ways to eliminate drift in old receivers but it really depends on your individual method (or preference) of operation. Almost all amateurs in the 1930s and 1940s were on CW and they were always tuning the receiver during a QSO. That was just the way it was - you followed the received signals by frequent adjustment of the tuning dial. It became "second nature" for hams to "tune around" for the best reception during a QSO. By the 1960s and later, voice comms were becoming more and more popular so a different belief was beginning to be instilled into hams - "you shouldn't have to touch the tuning dial on the receiver. The received signals (the transmitter) shouldn't drift and neither should your receiver!" As SSB became the dominate voice mode, the receiver required virtually no drift from either the LO or the BFO. This has resulted in today's hams expecting "drift-free" operation in a receiver that was designed when CW was the primary mode of amateur comms and changing the frequency of the audio tone heard in a drifting signal didn't affect copy at all. Although "drift-free" design was possible, the components and circuits necessary made this expensive to achieve. Considering the economic factors of the Depression it became next to impossible to build a "sellable" receiver that didn't have some drift. The HRO will drift in frequency for about 30 minutes and then settle down somewhat. In the bandspread mode the drift is much more noticeable. This is because of the resolution of the PW-D in the bandspread mode. A small drift of a couple of kilocycles appears as a drift of five to ten "index marks" on the micrometer dial (depending on the coil set used.) So, if you want to operate your HRO "as original" you'll have to get used to the drift. Otherwise, you can change the LO coupling capacitor to a NPO type and add in zener regulation on the oscillators or build a regulated power supply for the receiver. But, original is more authentic and this is about nostalgia, isn't it? Conclusions - The pre-WWII versions of the HRO receiver generally aren't found operating in too many vintage AM ham stations today and that's a mystery. Why is such a high-performance communication receiver virtually ignored by the vintage AM enthusiasts? Probably, it's because the early HRO is rather small and basic in its appearance. It doesn't have a large illuminated dial but rather has a device that requires the tuned frequency to be indirectly determined by referencing to graphs. It has single-ended audio, no tone control and the only selectivity control is via the Crystal Filter. It requires storage for the extra coils and it does require more accessories than normal, like the power supply, extra coil sets and speaker. However, when it comes to sensitivity you can't beat the HRO. When it comes to bandspread resolution, there is no better receiver than the HRO. The HRO's later kin - the HRO-50 and HRO-60 are fairly popular today with vintage AM enthusiasts, still giving competitive performance even on 10 meters. These later receivers are larger and do feature a built-in power supply, push-pull audio and a direct readout dial which seems to confirm our opinion as to why there's a lack of interest in using the pre-WWII HRO as the station receiver. 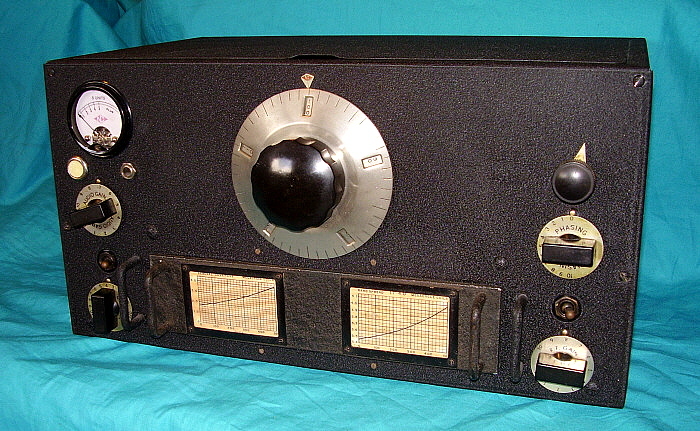 Today, the HRO is revered as one of the great designs of pre-WWII communication receiver production. Though collector emphasis and resulting high prices are on the rarer early versions, any of the HRO receivers will give the user superior performance, especially following a careful, thorough rebuild and alignment. With a production history spanning 30 years, certainly the HRO design concept was a long-lived one. It was a great receiver then and is still a fabulous performer some seventy-plus years later. It is National's "masterpiece." 12. Thanks to all of the National Co., Inc. and HRO enthusiasts that have sent in photos, serial numbers and other information. Your input has helped to expand this article and add detailed information on the production and history of these great receivers. January 2014 - More details on alignments of Coil Sets and IF alignment. Correction to assembly of the worm gear thrust assembly.